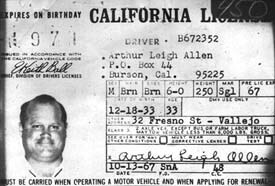 Don Cheney met Arthur Leigh Allen in 1962 and maintained a friendship with him through 1968. Their friendship ended in 1969, after a New Year's Day conversation in which Allen spoke of killing at random and calling himself "Zodiac." Cheney soon moved to the Los Angeles area and eventually came forward to the police after reading a quote in a newspaper article that spurred his memory. The quote was of the Zodiac killer's threat to shoot out the tires of a school bus and kill the children inside. Just months earlier, Cheney realized, Allen had talked of doing the same thing. I interviewed Don on Dec. 30, 2000. He allowed me to record the nearly three-hour encounter. Below are several excerpts of our conversation. TV: Do you think the possibility exists that Zodiac was not Arthur Leigh Allen? DC: I've thought about that from time to time and I don't see any way that it could not be Arthur Leigh Allen. If it was not him, it had to be somebody that looked like him and was a close friend of his. Somebody that, maybe they conspired together, or...or that he talked to the way he talked to me. Somebody that could have quoted that quote. TV: So, you believe that Zodiac was definitely Arthur Leigh Allen? DC: I'm morally assured that it was Leigh. TV: Did Leigh ever date? DC: I don't think so. I don't know if he became that way or not, but he was interested in women, but he didn't have much luck with them. TV: Was there anybody in particular he was interested in? DC: There was a waitress one time that he pointed out to me. TV: When was that? Do you remember what year it was? DC: I don't know...would have been maybe '66, or...it was in a period when I lived in...I don't know if I lived in San Francisco or Concord at the time. It's a vague memory. I can't give you much detail. TV: Do you remember where the waitress worked? 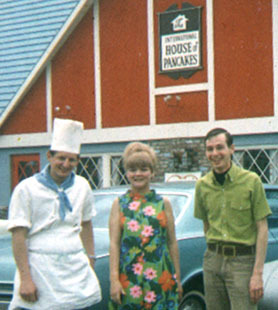 TV: Was it the...do you remember which pancake house it was? DC: The one right around the corner. TV: So that was the I-HOP? There's an I-HOP just about a tenth of a mile from his front door there at 32 Fresno. DC: Well, at the bottom of Fresno and turn right about a block, and that's where it is. TV: Yeah, that's the I-HOP.